Here is the other project that's been consuming me. The re-do of my website, see the screen grab above of one of the pages. For Free-for-All I would like a critique of my new site. You can comment about anything - images, content, layout, flow, whatever. I promise not to get mad with what you suggest (I am quite familiar with rejection) if you promise not to get mad that I might not use your idea. Fair enough. As always, I value other's opinions so this is a sincere inquiry. Thanks ahead of time. 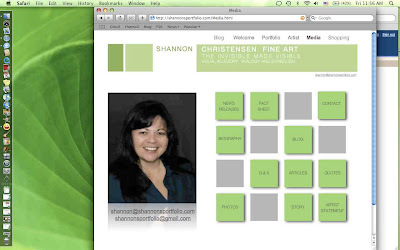 I like the green, the squares and the info they include, that's a great picture of you, I like that you have a self-portrait for your "Artisit" page,I like the fonts and I like the over all simplicity. It does seem like it needs just a little something. I would think that you wouldn't want a background color, because you don't want it to effect the look of your paintings, but maybe you could do the same green color on the outside columns. A small strip on each side, just enough to add something, but not change the appearance of your paintings. I like that green color. I also like that picture of you. I don't really like the squares that are close to your picture though. But thats just what I think. Thanks everyone for taking the time to look through the site and sharing what you think. I'm thinking about it and looking things over. I don't know. I really like the title look on your current blog. I think it might be because I'm into the neutral, natural tones right now. I like how you have the picture on the right hand side of your title and how the colors are easy on the eyes. However on your new blog I like the new portrait picture of you and the flow of the page. It looks like it might be easy to navigate through your blog utilizing the squares.